At RLC Machinery we buy and sell all types of quality farm machinery and small plant. We can source specific machines you require or alternatively let us get the best possible price for any machines you are looking to sell. Haulage can be arranged on all machines throughout the UK. We also run a small, expanding fleet of self drive hire machines. If you are interested in anything on our site please do not hesitate to contact us..
RLC Machinery are proud to be the stockists of the new range of the UK made GRIZZLY WRAPMASTER front mounted bale wrap carriers. Coming into stock April. Many variants and colours available. New Holland 570 Conventional Baler. Sell Your Machines with our brokering Service! Let us sell your machines for you. Now working in conjuction with the Wrights Farming Register. 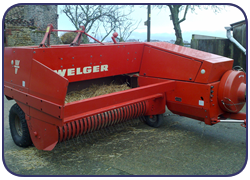 WANTED- Quality used farm machinery.